WE ARE FORTUNATE to have two beautiful chapels on the grounds of Forest Hills. Our chapels can be rented for many different kinds of occasions, including memorial services, concerts, and weddings. Please contact us or call the Cemetery Office at 617 524 0128 with any questions about how we may accommodate your special event. Your choice of chapel can be reserved for your special service by contacting our staff in advance. These chapels provide lovely, gracious spaces for a viewing just prior to cremation or interment, for a memorial service held at a time after a cremation or burial, or for any other service. The Forsyth Chapel is located at the main Cemetery entrance and is truly a tribute to nineteenth century architecture, with its striking elegance, symmetry, and superb acoustics. Paneled in carved wood, with a soaring cathedral ceiling and exquisite stained glass windows, the Forsyth Chapel is a most appropriate and respectful setting for a variety of services, including memorial services, funerals, and even weddings. Although any style of music is welcome, family and friends can arrange to use our famed 1923 Hook and Hastings pipe organ. Our office staff can usually provide a few names of organists and soloists. 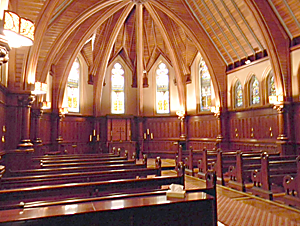 The Forsyth Chapel seats 100. The Lucy Stone Chapel is located at the Forest Hills Columbarium and Crematory. This elegant chapel provides a magnificent setting for memorial services or related gatherings. Built in 1893, the Lucy Stone Chapel is named for the noted Boston feminist and abolitionist who was also the first person to be cremated in Massachusetts, at Forest Hills. 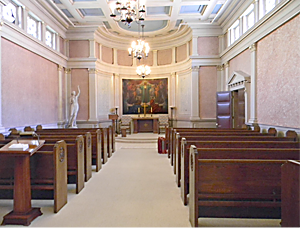 This Chapel’s airy neoclassical style has an eternal elegance, and seats 120.